Jewel of the Thames by Angela Misri is a wonderfully light-hearted mystery novel. Portia Adams is a delight – nineteen years old in 1930, Portia inherits 221 Baker St. and is whisked from Toronto, Canada to London, England with her guardian Mrs. Jones. Once there, Portia finds herself going to law school, aiding in solving crimes and delving into her own family tree. Divided into three case files, Jewel of the Thames presents the reader with three different mysteries (a jewel thief, a murder and a kidnapping) that Portia finds herself participating in solving all while efficiently stacking up the clues for Portia to dig deeper into her family history, and the history of John Watson and Sherlock Holmes, the famous tenants of 221B Baker St. I highly enjoyed Portia. An intelligent, capable, kind young lady who possess the wits and desire to help and solve cases around her. She has great interactions with her downstairs neighbours the Dawes family. Son Brian is a Constable at Scotland Yard and enables Portia to better access the information she needs to solve her cases. Despite the flirty undertones to their interactions, there is no real romance in the book and I, for one, found it quite refreshing. The writing in Jewel of the Thames is intriguing and unique. Angela Misri has managed to convey both a sense of the 1930s and old Sherlock Holmes novels through her prose and dialogue. I was very easily able to see myself in 1930s London with Portia as a proper young lady, and as the detective – the language used is very methodical and calculated. And while the mysteries to her past are quickly hinted at and any Sherlockian will pick them up immediately, it was still fun to see Portia put everything together. Jewel of the Thames is a wonderful addition to the Sherlock Holmes universe and I can’t wait for book two! 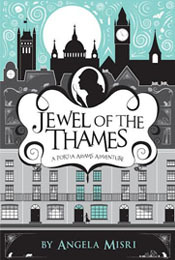 Thanks to Fierce Ink Press I have on e-Copy of Jewel of the Thames to give away! Giveaway is open worldwide except for the UK. Please fill out this form to be entered. This sounds like a fun one! I do love Sherlock spins, so I will definitely be checking this one out! My goodness are Sherlock retellings ever popular right now! Thanks for the very kind review Cait, I’m so pleased you enjoyed it! If you’re in the Toronto area on Friday, we’re doing the Book Launch at Ben McNally’s on Bay & Richmond, and I’d love to say ‘thank you’ in person!